We've developed a new Joomla and Virtuemart extension which enables you to search your products the Google way. For demo please visit http://testvm.rupostel.sk/ and see RuposTel VirtueMart Ajax Search with input box "Product Search" at the left modules (this is VM1 on Joomla 1.5 site). For VM2 site, and ajax search in component mode, search for "saw" within http://vm2.rupostel.com/vm2010 Since March 2015, the search works also in no-ajax mode. Note 2: If you updated virtuemart to above 2.0.14, you also have to update this module as well with the link below, or delete your virtuemart's /components/com_virtuemart/virtuemart_parser.php which causes issues with extensions that were built for both versions of virtuemart. The PRO version of this extension is available only via our official download section for OPC Subscribers. Both versions of the module include a backlink to our site. If you need 1 hour support for this extension in matters of functionality, design or customization, please purchase 50 euro of additional services and let us know. - added a new options: "debug - to be able to style the ajax pop-ups" and "search products only in stock"
We had released a PRO version of Ajax Search for OPC subscribers which can be downloaded from our download area. Ajax search pro now supports component ajax search mode or drop down search mode. There are lot's of minor fixes in the PRO version. It can use it's own product listing template, or Virtuemart's category template. Please use our forum or send us an email in case you needed help. Since June 2015 we do not provide standalone installer package and we rather bundle all of our extensions under single OPC subscription and single installer. Hello, sorry for my english, i install this module but when click on the suggested product redirect on bad link, put in link /modules/mod_vm _ajax_search/aj ax/ and redirect on bad page. how i can delete this route from link. hello Ruben, this seems to be a problem with SEF component. I will investigate if it does in Artio SEF as well. Which SEF component are you using? I wonder is there an option to limit the search in sertain category? For example: I make two categories in my online shop - "Clothes" and "Shoes". I want to put a copy of the module in "Clothes" and another one in "Shoes". When a search is performed on each of the copies of the module, to show results only from the particular category. Is this possible? please have a look into /modules/mod_vm _ajax_search/aj ax/index.php where you can customize your SQL queries. In the next version Ajax search will work with joomfish-virtue mart sites and will be able to search translations of the product. Hey, thanks for the fast replay! :) I looked at this file but I don't know PHP and I don't understand what should be changed in order to customize the SQL queries. Anyway, I'm not sure that's what I need. If anything is changed in this file, this will limit the search for all the copies of the module I make. I want to make one copy for category "Clothes", another copy for category "Shoes" and etc. That means for each copy of the module, different settings. The settings in the index.php file are going to reflect for all the copies of the module, aren't they? What I need is more like an option in the beckend settings. The default search call is going to the default root level instead of the relative path for the Joomla install. where in /modules/mod_vm _ajax_search/aj ax/index.php would I adjust the default seach call to default to the root of my joomla install instead? If I can get this little bit figured out this mod will be a perfect solution for my search needs. Thank you so very much for the fast reply! Got it fixed and seems to be working great! I not use any seo component just mod_redirect with htaccess, i check the new updated version but not workin on localhost. How to set the sizes of the image? The live search works but. After typing a search string and clicking the search buton it doesnt delivers any results in the search page. 0 Results. If you press "enter" after typing works well. Hi and thanks for this module. can you tell how to add the short description? I have a problem with the field VM Searchpage URL. It doesn´t work although it works directly in my browser. It worked on my old testing site but no in this new one. My domain in VM is ok. Please tell me, where it can be changed? I have a Joomla Virtuemart which is installed in the directory MYSITE.COM/RU/ and when I try to use your module, it is an error 404. If you are getting problems with relative path such as /CATALOG/index. php being just /index.php please make sure your URL and SECUREURL in Virtuemart configuration at Security tab is properly configured. I have correctly configure URL and SECUREURL in VM. If I type my url + what I have write in VM Searchpage URL (relative to domain) I can see the advanced search page in VM. What to modify in default.php file? what line? I have correctly configured URL and SECUREURL in VirtueMart. I looked through all the code default.php. Adjusting of $base_dir did nothing. I've created new forum for this extension because JComements does not support php tags in the comments. It does not require registration, but in case you'd like to get registered you can use this link on the left side of this page. Well I am using SH404SEF. Maybe Conflict? We've just released a new version. Please let us know of any bugs or comments at our forum. Hi. Nice module. Its work fine, but not lisplay img thumb :( Only grey box. hello, please have a look into the source code of the generated ajax page which you can find in you /cache directory and let me know the urls of the images and if they are generated. It requires a GD library. all generated thumb in this patway created. GD lib conected. But in dropdown search results pictures not displayed. Hey! Thank you for this great module, it works wonders on the site I'm currently working on since it is the only ajax search that I found to be properly working with VM. I do however have a problem with the images - just as mentioned before there are no images generated when I search for something, only grey boxes. I checked the cache folders and there wasn't anything generated there too. I also get an error on the bottom of the results stating "Warning: Invalid argument supplied for foreach() in /home/instock/p ublic_html/shop /plugins/system /rokcandy_syste m.php on line 125". I would be really grateful if you could help me! Hello, pls make sure you have appropriate permissions on the cache folder and also for the VM image path. It uses GD to generate the thumbs, so please check if your hosting supports it. The ajax page is loaded in different path than joomla's index.php file which can cause problems with some of the external plugins. If i have a little bit time, i can rewrite it into module with a component helper so it loads as a normal joomla page. Hello, great search and really useful but how can we modify it to work for virtuemart 2 with J1.5? The first time any search phrase is entered, below the search results the following error messages appear. What versions of Joomla and Virtuemart is Virtuemart Ajax Product Search compatible with? Has anyone tested Virtuemart Ajax Product Search with large datasets for 10,000 products and above? Hello, the ajax search runs on all versions of VM1.1.x and Joomla 1.5 with Joomfish or without and does support more then 10 000 products as far as your database can handle it full text search within it. The results are then cached and the database is not used. We are currently working on version for VM2. The ajax search results include products that have been unpublished from virtuemart, is there any way i can stop it showing these without deleting the products? It does not use the Joomla's caching system, therefore to delete it's cache you must delete the cache manually within Tools -> Clean cache. I just checked my version of the joomfish file and it prevents the line to trigger this notice. I'd recommend to update the joomfish if possible, or update just the file mentioned. VM2 version is now available for download. Enjoy ! I have the problem you are mentioning with part of the URL missing so the image is broken in the Ajax search. How do I change that path so it works or remove it displaying images at all. I checked and if I add the part that is missing it works fine. The search works very well and very happy with it other than the "red x" where the image should be. I have the problem you mention above with part of the URL missing so the image is broken in the search. How do I change that path so it works or remove it displaying images at all. I checked and if I add the part that is missing it works fine. The search works very well and very happy with it other than the "red x" where the image should be. input parameter is a product's column product_thumb_i mage. I can't replicate this issue on my demos. Also I was wondering how you change the image size output. I thought I found it but it isn't working. I want to make the images larger than they are by default in the search results. I installed your perfect Ajax search and it worked perfect until I activated SH404SEF (I purged the database). As soon a I click on a search result I'm redirected to the homepage (I think a 404). I'm using VM 2.0.12f. And Joomla 2.5! How can I modify the code to sort the results by Product SKU or Product Name? "Figyelem: Az Ön Joomla telepítésében még aktív egy vagy több elavult Virtuemart bővítmény. Távolítsa el vagy tiltsa le őket"
"Warning: In your Joomla setup You have an active or out of date expansion... Remove or prohibit them!" Is there any chance,U will fix that? I got the same error, please fix it. hello friends, i will fix this later on today. i will also update it in the next version. Uninstall and install corrected my error, thanks. (it requires the same fix as above). The reason for this error is that VM2.0.16 now includes the virtuemart_pars er.php which was used to decide if VM1 or VM2 are being used. it does not work on VM 2.0.18a on Joomla 2.5.8. I checked again on clean VM 2.0.18a on Joomla 2.5.8. No problem. It works fine! ...and also how to change the URL that it uses to display the product when you select one? I'd like it to reload the category page with just that product if possible (I've got a kind of one page Virtuemart). If not, which page in Virtuemart would I edit to change the look of the product page, when clicked? Hello all, I tried to look through the posts but I cant find it. I bought a template with the Ajax Search plugin integrated. The template is Joomla 2.5.8 with VM 2.0.14. I tried to do an update to VM 2.0.18 and now Im getting the error; "Attention: You have still old vm extensions in your joomla installation active, uninstall or disable them"
Turned everything off and turned it back on one by one until I found that the Ajax Search module is the problem. Can you help me with this please??? When I search some terms which is on product description, the products containing that word in its description appear on the ajax results but when I click on search they dont appear on search result page. for ajax search. I will check the installer, but i fixed this a long time ago. The virtuemart file is not used by any part of Virtuemart, includes a fatal error and there is no reason to have it. hello, i've updated ajax for vm2 now on 8th feb 2013. pls update your module in case you are having any issues with it. i completely removed the vm1 checks. I'm really impressed ! Problem solved ! 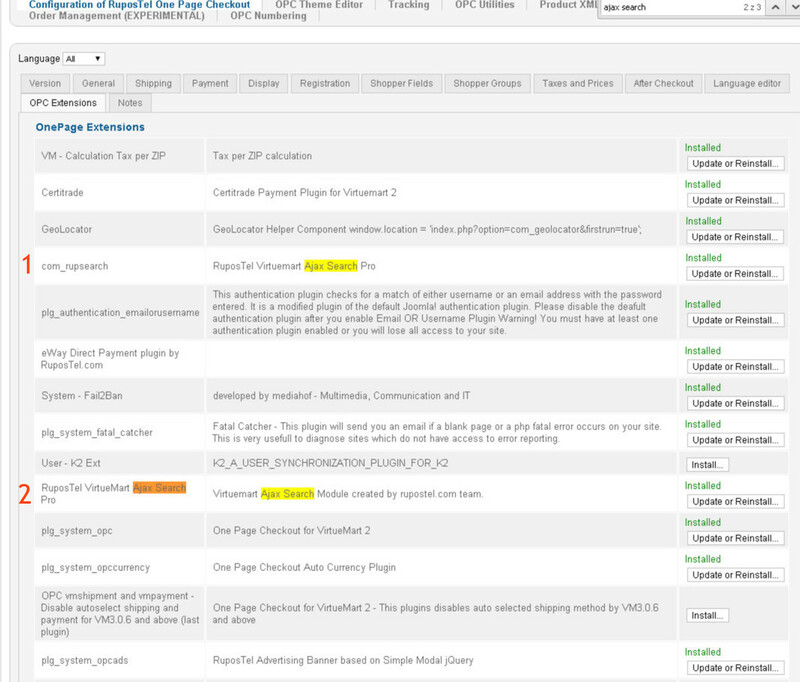 I have another problem when I click on one of the results of ajax search, the page shows virtuemart frontpage modules? Also when I search for a term some results appear on the ajax results. However, when I click search button, those results dont appear. Only those products having the search term in its name appear on the search result page. Hello, yes, the results are not handled with the module, they are handled by the default VM search page. You may disable the search button so there is no form submission possible. This ajax search module we developed for our primary hosting customers for stock pairing system so our customers can pair two databases of products together. We also plan to add this module to our main component - one page checkout so wholesale customers can easily search, navigate, set and add to cart the products for which they already know the SKUs or names and need a fast add-to-cart option. Once we add it to OPC, it will be better supported with much more features. Hi, where can i find the update? Hello, how is it possible to search throu custom fields? Still have a lot op problems: I imported my old DB with 1000 products. I am rebuilding the categories (new) using Phoca category module, but when I click in the frontend on a category I get a Error 500 database error. Disabling the AJAX module makes all errors go away, so it is definately related. But offcourse I don't want to disable it, so please help! Hi with virtuemart 2.0.18a in not complatible. Marco, are you using joomla 1.5? We haven't actually tested the ajax module for joomla 1.5 + vm2. We can check this later on. Thank you so much for this extension! Hi! Thanks for this great extension. It woks fine, but it shows the image with the lowest id nr but I want it to show the first product image. Any tips on that? Hello, i use joomla 2.5.8. and virtuemart 2.0.18a but when i enable the module i get "Attention: You have still old vm extensions in your joomla installation active, uninstall or disable them"
I saw a few posts regarding this subject but no clear answer; if I click on a thumbnail generated by the search function Im redirected to a 404 / my homepage. If I click search it does work. What can we do about this? The search function is really important to our site! Me too, this needs to be solved! Hi, how I can add the product category in results? Thanks! Exactly the same as ümit. I have posted again about that but as i can see in this comment page users only post problems.. No one a solution.. Waste of time. I just tested the installation on Joomla 2.5 + Virtuemart 2.0.18a and it works all well. Currently the version for Virtuemart 2 is not compatible with other joomla then 2.5. Please download the proper version. sh404 is not compatible with this search module for Virtuemart 1.1.x. You may try to experiment with the order of the sef plugins which may help it. sh404 is not able properly determine sef url when not called from the index.php of the root joomla. Same problem here ! I'm using sh404 and every component in my website behave properly except this one. I'm running VM 2.0.18a and J2.5. I did some investigation and apparently the link generated for the product name doesn't have a category Id. I can't figure out how to get the category Id from a product in the file ajax/index.php. If you just tell us how to access to the related category id it will work for URL rewriting. because the in file: modules/mod_vm_ ajax_search/aja x/index.php error! hello, this seems more like a sef issue because products can be in more than one category and the sef url should not depend on it's category variable. your code should work, but only if you have the product in one category. the query will select the first one (randomly) even when the category is unpublished. in our sef cusom extensions we usually chose to display top category of the category in which the product is located if not a special category such as deals or similar. i recommend that you get a commercial sef extension which would show the product url always the same regadless of it's defined underlying category. hello, our vm2onj25 site is only for testing and we do not have a 3rd party sef installed here. but yes, we can add the category there even though it should not play a role on a good implemented sef. je suis sous VM2.0.14 +JML2.5 j'ai fait la mise a jour pour VM2.0.20 et la message d'erreur "Attention: Vous avez encore de vieilles extensions vm dans votre installation joomla actif, désinstaller ou désactiver les" comment je peux faire. how is it possible to search throu custom fields? hello, which custom fields specifically do you mean? in general they are all plugins and the module does not know what exactly to search for. you may want to modify the sql in the files if you know where the data are stored. Thanks for your answer but now i have a new problem, my pictures are biggers and my (panier) cart is an opposite side. there i configured die custom field group "details"
J'i vraiment un gros soucis, j'ai bien supprimé virtuemart parser.php, et c'est ok mais mes images et mon panier ne sont plus conforme. template 2.5.9/2.0.20b upgraded from 2.5.8/2.0.14, deleted the parser.php file, etc. Seemed to work, but now the Ajax Search no longer drops down when typed in it. Worked with old VM sample data. With new VM items, nothing. Can add a term and click submit and get results, but no drop down ajax effect. Any ideas where to look to figure out what is wrong or conflicting? We uninstalled and reinstalled your latest version, but still no good. If I turn on a different ajax search (RokAjax), that has the drop-down effect that works, but we do not like that module as well as yours. Is there some other thing we need to do to create the search cache or pictures for your module? Like I said, it worked with the sample data loaded, but once we deleted those items and cleared the Joomla cache, now your search module does not do the drop down effect. Any way we can figure out how to get yours working again? Thanks. Hello, I have multilanguage support on my site (Joomla 2.5.9 and VM 2.0.14). When I search products - url is wrong. Double lang marker. It happen for all languages on site. I dont have any SEF components. Only original com_redirect. I've upgradet to 20.0.20b, and no drop down too. where can I change this path? thank you! Greetings. I have a multilingual website. Do not link to the correct formation of the product - / T3Fremework_tes t/index.php/en/ en/shop/product -4-детал. Help pliz. Where is the edit? Greetings. I have a multilingual website. Do not link to the correct formation of the product - / T3Fremework_test/index.php/en/en/shop/product-4-детал. Help pliz. Where is the edit? Please, the answer to me. Due to the fact that you did not specify that it is not multi-lingual, and are willing to be responsible only for 50 euros, I lost a lot of time to solve the problem from the wrong reference. And as soon as I solved the problem, a new I switched languages ​​and there is an error in the Ajax response. Asli no Saporta, indicates that your unit does not support multilingual. A module is nice, but now will have to be abandoned. Hello, we hadn't tested the module yet on Joomla 2.5 multilang site which is true. This extension is only compatible with JoomFish on Joomla 1.5 and Virtuemart 1.1.x. The VM2 version is not yet multilang and we are preparing an update to use component/modul e logic instead of calling an own index.php file which does not work with many SEF routers. There is a way to not select the first result? I explain: when I search some word and press enter the search opens the first result. I don´t want that. I want the full search result for that word. Hello, have some trouble with the module since a couple of days. Can't figure out what's wrong/I might have changed. if this module is turned on, for login pages, single article menu items. the pages are blank..
How do I change the "search in shop" text in the search field? It is a standard language file entry. In joomla goto extensions, language manager. Click the overrides tab, Click new, in the search at the left search for "search in shop" with "value" radial button selected. Then you can edit to what you like. Hello, i'm using falang 1.3.1 and i've already deleted virtuemart_parser.php. In english language all works, included module and language, but if i switch in Italian language i have a blank page. Hi. Can someone explain/indicat e if this Search Module picks up the statistics (products) as the original search component of joomla? this is very important for all, because of us need to know what people want, or try to search in our website, right ? One of the reasons why it may not work for you is the Joomla's FTP layer which is not implemented by the module. It uses php's functions to save the thumbs. Let us know if the thumbs are indeed generated in the directory or not. Hi Stan! the thumbs are indeed generated, but the thing is that the module is working perfectly in chrome and IE, the thumbs are visible, but mozilla is showing the grey boxes, this is wierd, I don't get it. any idea? Hello, i must say that this module does no statistics of the search as we rather run the queries without php once they are fully cached. This enables you to run the module with 100 000 products on a normal server. If you used statistics for the keywords, you'd need whole rack of servers with database replication to do the same job. idea on the question of Andi_A ? how can I change the encoding of the output results to Cyrillic( Russian ?) Thank you! This module is fantastic, but i can't to use under SSL mode(in cart, in account manteinance,... ). In non SSL mode works 100%. Did you solved this problem ? Hello, pls write us an email instead of using this comments. Is there a Feature, which can write the keywords of customers in logfile/datatab le, for using statistic result view. hello, if you get an error with the table, please make sure you installed both com_rupsearch and also the module from OPC extensions tab (pro version). module and com_rupsearch should be at about similar version for them to work. let us know at email if you need help for this system. we had extended the search very intensively in last few months. I'm having difficulties since last update, The search has stopped returning results?